Bishop H.G.Mathews Mor Timotheose, celebrating Holy Mass during his visit to St George Syrian Orthodox Church in Galway. 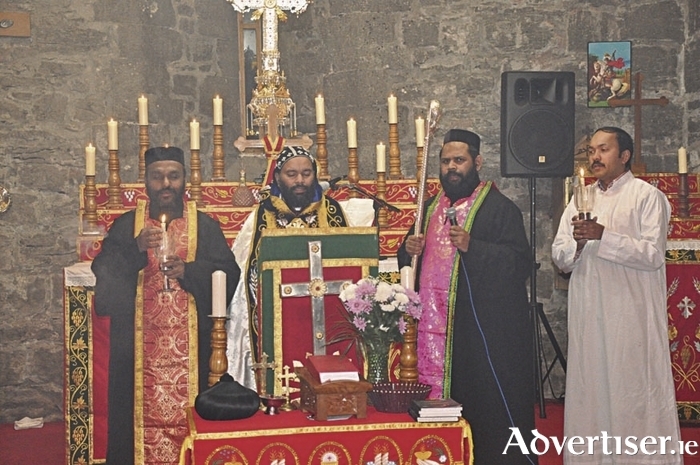 A Syrian Orthodox Bishop visited St George Syrian Orthodox Church in Galway recently and offered Holy Mass in relation to the memory of Saint Gregoriose. Bishop H.G.Mathews Mor Timotheose, metropolitan of Syrian Orthodox church affairs of India, who lives in Syria with the Patriarch of Antioch at Damascus, was given a warm welcome by the parish priests and faithful. After the reception and evening prayer he offered Holy Mass in the Brothers of Charity chapel in Kilcornan, Clarinbridge. During his speech afterwards he described the crisis situation which is faced by the Christian communities especially Syrian Orthodox Christians in Syria and Iraq. He said that lot of innocent people have lost their lives, families and properties in the civil war. He mentioned during the speech that H.G.Yohanna Ibrahim Mor Gregoriose, Syrian Orthodox bishop of Aleppo, who was kidnapped by ISIS in April 2013, is still missing and that there is no information available where he is now. He also remembered in prayer, the many priests who were killed by ISIS for their parish and faith in Christ. “The people who are staying in Syria and Iraq are living only on their faith in God and nothing else. He also said that many of the media are closing their eyes towards the issues in Syria. “Supreme Head of Syrian Orthodox Church, Patriarch of Antioch His Holiness Moran Mor Ignatius Aphrem II said that that if God is with us, there is no need of fear of anything, so stay in Syria untill that last Syrian Orthodox faithtful lives in Syria. I ask everybody to pray to God for the peace in Syria,” he concluded.